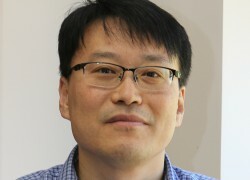 Dr. Seonho Choi is a professor of Computer Science at Bowie State University. He earned his B.S. in Computer Science and Statistics from Seoul National University, Seoul, Korea, and his Ph.D. in Computer Science from the University of Maryland at College Park. Dr. Choi’s teaching interests include computer/network security, network protocols, and operating systems. Since 1997 when he joined BSU, he has taught various courses including computer organization, computer architecture, systems programming, senior capstone, operating systems, communication networks, foundations of computer and network security, etc. In teaching his classes he strives to provide the state-of-the-art knowledge that can be used as a basis for building their future career. His primary research interests are in the field of computer and network security. He has acquired several research grants from various funding agencies such as the Department of Defense and the National Science Foundation. Dr. Choi is serving as the chair of the department.